Sneaky sneaky, Atlus, spreading your preorder/early adopter bonus across two games. Fans who pick up this fall's Persona Q: Shadow of the Labyrinth for the 3DS get the second half of a set of Persona 4-themed tarot cards. The first half? That's the fightin' half. 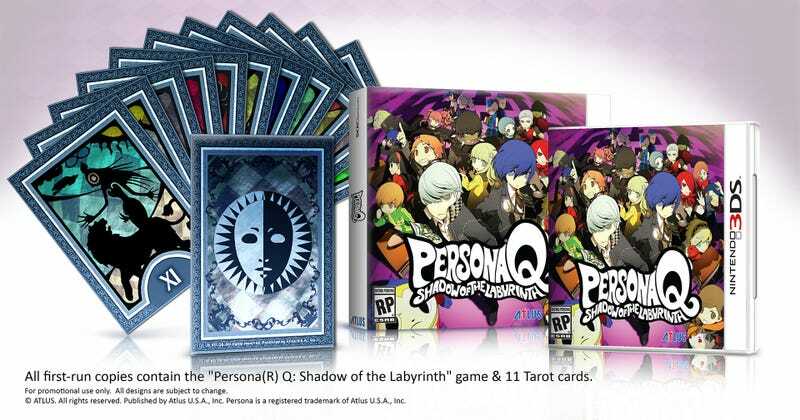 In order to collect the entire set of Persona 4 tarot cards, based on the cards used as invokers in the original role-playing game, fans will have to score both Persona Q for the 3DS and a copy of Persona 4 Arena: Ultimax, the enhanced version of the fighting game, coming in September to Xbox 360 and PlayStation 3. How very tricksy. Oh well, there's that. The announcement says preorders are open at the official website, but I'm not seeing them. You should just give up.